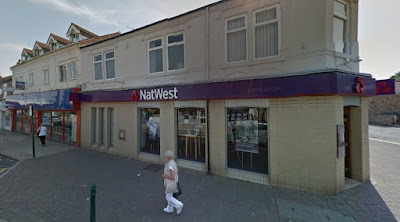 The NatWest branch in Dinnington, Rotherham is set to close next year. It follows the closure of the HSBC branch, just over the road, and leaves the town with the prospect of having no major High Street bank. Following a review of the branch network by the taxpayer-backed Royal Bank of Scotland Group plc, a decision has been taken to close 62 Royal Bank of Scotland branches, and 197 NatWest branches. The Dinnington branch of NatWest on Laughton Road is due to close on June 4 2018. An RBS spokesperson said: "More and more of our customers are choosing to do their everyday banking online or on mobile. Since 2014 the number of customers using our branches across the UK has fallen by 40% and mobile transactions have increased by 73% over the same period. Over 5 million customers now use our mobile banking app and one in five only bank with us digitally. "We're providing our customers with more ways to bank than ever before – they can choose from a range of digital, to face-to-face options. As customers continue to change the way they bank with us, we must change the way we serve them, so we are investing in our more popular branches and shaping our network, replacing traditional bricks and mortar branches with alternative ways to bank, including; Community Bankers, Mobile Bank on Wheels, and Post Offices, so that we can reach even more customers. "We expect these branch closures to result in around 680 redundancies. We realise this is difficult news for our colleagues and we are doing everything we can to support those affected. We will ensure compulsory redundancies are kept to an absolute minimum." The closest branch for Dinnington customers will be at Wickersley. NatWest announced that it would close its Corporation Street branch in Rotherham town centre in 2014 with the alternative branch on Effingham Street remaining open and refurbished. Without a local branch, NatWest and HSBC customers can get a balance, make withdrawals and pay in cash and cheques at the Post Office, which was only saved thanks to a link up with retailer, Heron Foods. RBS said that this latest move will result in around 680 redundancies, adding, "we will seek to manage this process on a voluntary basis." Rob MacGregor, Unite national officer said: "The Royal Bank of Scotland has decided to decimate its bank branch network. Now serious questions need to be asked about whether these closures mark the end of branch network banking." Earlier this week, Lloyds Banking Group informed staff that they will be closing another 49 branches of the Halifax, Bank of Scotland and Lloyds Bank, including two in Sheffield. Customer Service - probably now an oxymoron when applied to banking. The Nat West decision means that a significant township, with a still growing industrial area and large amount of housing - plus the housing in the Anstons, Woodsetts, Laughton Common left without a proper bank. No doubt a lot of people migrated to NatWest when the HSBC ill-advisedly closed and possibly also from Barclays at Kiveton Park. HSBC Dinnington was actually probably busier in footfall than the branch at College St., Rotherham but is this another case of decision makers from within the M25 manipulating statistics and/or not giving any heed to the rest of the country?